Gustav Otto Wolff was born on 3 April 1872 (probably in Hamburg), the son of George M. Otto Wolff and Ida Strube. He was the nephew of Gustav Wilhelm Wolff. Gustav Otto Wolff committed suicide on 9 May 1943 at Orselina, Switzerland. 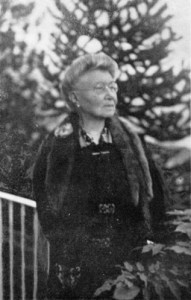 He married Caroline Johanna Kielich in August 1897. Johanna was born on 30 January 1858 at Sovetsk, Russia, and she died on 3 May 1943, in Orselina, Switzerland. 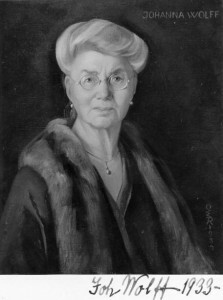 Her death may have been the cause of Gustav taking his own life a few days later. In the possession of our family is a book of the following description: Title: Namenlos: Frauenlieder. Author: Johanna Wolff ; Published: Breslau, 1900 (New Edition). Inscribed on the inside is: Hamburg (25/7/04) from [or in memory of] the authoress, Cousine Hanna Wolff to Nora Loeck. Some of the material on this page is from the website of Hugo E. Martin and is copyrighted. You may benefit by going there to get additional information, as well as learning about the compositions made by Hans Martin (1916 – 2007) based on Johanna’s poems and also visiting the Conventus Musicus website. Ahasver, von Johanna und Gustav Wolff. Titelzeichnung von Fidus. Berlin, Verlag des Dramaturgischen Instituts Abteilung III (E. Ebering) 1899. 102 pages. (Wandering Jew — Poetry.) 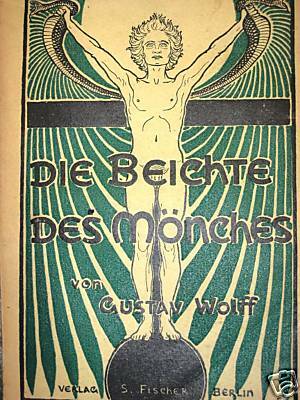 Wolff, Gustav, joint author. It appears to be of an anti-semitic nature. At the back of the book is a page devoted to advertising three more books one is ‘Namenlos’ by Johanna and the other two are both authored by Gustav alone and appear to be travel books, the first is called ‘Capri’ and the other is ‘Die Beichte des Munches’ (see cover below). 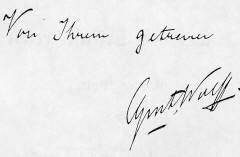 Unfortunately, there is a possibility of confusing ‘our’ Gustav Wolff with two other authors of the same name. The first is a Gustav George Wolff who writes about classical philosophy but whose dates are ‘wrong’ being 1819-1873. The second is a Gustav Wolff who was a psychoanalyst and was among Jung’s circle and he too has nothing to do with the Gustav Wolff discussed here. 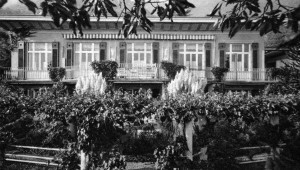 It should be noted however that all three ‘Gustav Wolffs’ have been misidentified and miscataloged in various library records so that it is at times painful to sort among the various bibliographic records one Gustav from another. Back to ‘our’ Gustav. 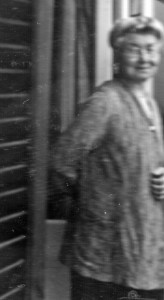 On 19 August 1897 his cousin, Clara May living in London and looking after their uncle Gustav Willhelm Wolff writes in her diary : ‘Gustav Wolff married to his nurse 15 years older than himself in Hamburg‘. Their jointly authored book on Jewish poetry was written in 1899 – two years after their marriage as noted by Clara May. 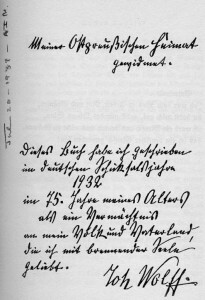 The German Literature archive owns a small Johanna Wolff collection in its Handwritten as well as General Document section of the library. 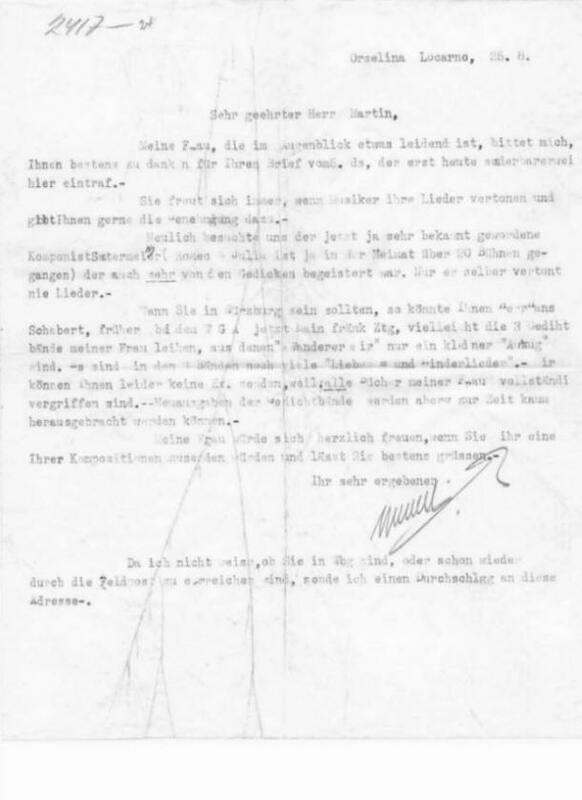 The Handwritten collection consists of a number of Johanna Wolff’s letters and poems, in addition to letters by her husband Gustav Wolff, while the other section includes newspaper clippings about her. 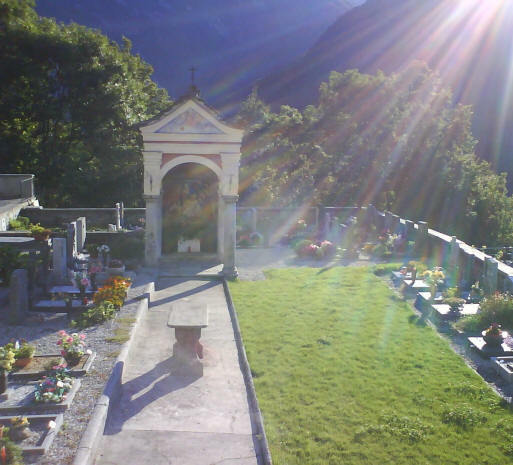 Because he suffered from severe rheumatoid arthritis the couple lived in Orselia (Italy?). 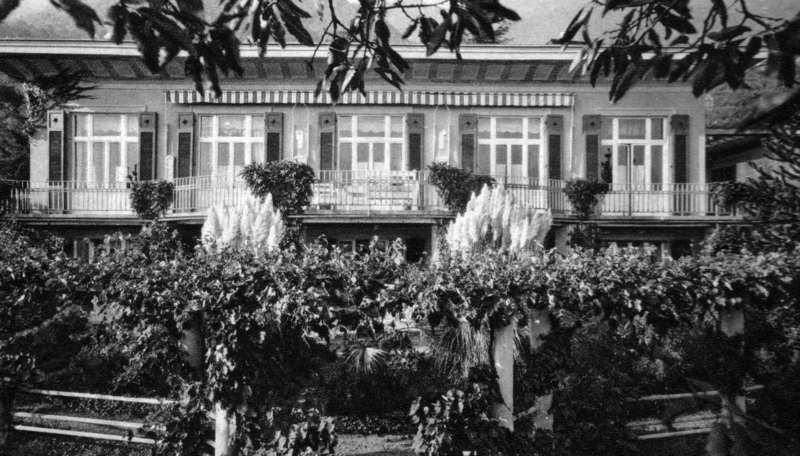 Gustav Wolff writes in a letter that Johanna Wolff’s book “Hanneken: A book of poverty and work” was very autobiographical. 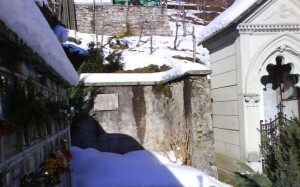 Below ‘The Hermitage’ at Orselina, the Wolff’s home in Switzerland. 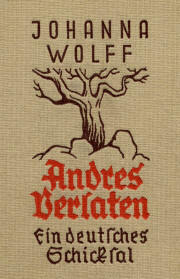 The signed inscription below is from Johanna Wolff’s Andres Verlaten. It is printed opposite the title page and forms part of the book. It is not handwritten, just printed to look as if it were. 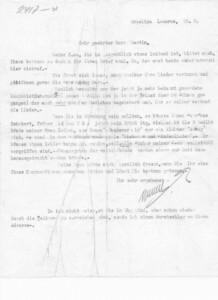 Below, a letter written by Gustav Wolff. Below, the cemetery in Switzerland where the Wolffs’ ashes were placed. The plaque on the wall in the second image below says ‘Hanneken’ and marks the spot where Johanna’s ashes were interred. COPY RIGHT NOTE (c) Copyright 2007 – 2009, Hugo E. Martin. The portrait above of Johanna Wolff is licensed under a Creative Commons Attribution-Noncommercial-Share Alike 3.0 Germany License. See: Hans Martin Blogspot. (please visit Hugo Martin’s web site for a complete list of Johanna’s works). Von Mensch zu Mensch – Gedichte, (1917). 179 pages. This can be read in PDF HERE. Du schönes Leben: Dichtungen. Berlin: Schuster & Loeffler, (1907). 144 pages. Du schönes Leben; Gedichte. Stuttgart [etc.] Deutsche Verlags-Anstalt, (1926). 129 pages. Frauen zwischen gestern und heute, Lebensstucke. Stuttgart, Berlin, Deutsche Verlags-Anstalt. [c1930] 359 pages. Das Hanneken: eine Geschichte von Arbeit und Aufstieg Frankfurt a. M. Rütten & Loening, (1919). 300 pages. (Previous editions published under title: Hanneken, ein Buch der Armut und Arbeit). Der LiebeGott auf urlaub. Zeitlose legenden. München, G. Müller, (1926), 236 pages. Die Meisterin: Schauspiel in vier Akten Berlin: Schuster & Loessler, (1912), 78 pages. Die töchter Sauls, tragödie. Stuttgart, Berlin, J. G. Cotta nachf., (1919), 150 pages. Vogelreuthers Mühle, Roman. Berlin, Steuben-Verlag P.G. Esser c [c1938], 214 pages. Andres Verlaten, ein deutsches Schicksal. Braunschweig, H. Wollermann, (1933), 287 pages. Das Hanneken; ein Buch von Arbeit und Aufstieg. Vierzehntes bis dreiundzwanzigstes Tausend. Braunschweig, H. Wollermann [c1912] 306 pages. Hannekens Grosse Fahrt. Königsberg, Pr., räfe und Unzer [c1935] 356 pages. Hans Peter Kromm der lebendige; eine Geschichte von ufer zu ufer. Erstes bis drittes Tausend … Berlin, Schuster & Loeffler, [c 1921]. Schwiegermütter, Novellen, Stuttgart, Berlin, J.G. Cotta’sche Buchhandlung Nachfolger, c 1928. Wanderer wir; ausgewählte gedichte. Königsberg (Pr.) Gräfe und Unzer  143 pages.